The United States has long been the leader of global innovation, but a recent report  (PDF) by the National Science Board (the advisory board to the President on research in science and engineering) suggests that America’s innovation advantage is slipping. Knowledge-based economic activity is gradually shifting towards Asia, and in particular China—America’s greatest strategic competitor. While America’s strength in science and technology will continue for decades, China is now in an enviable position. After all, growing pains are preferable to the aches and pains of an old man. 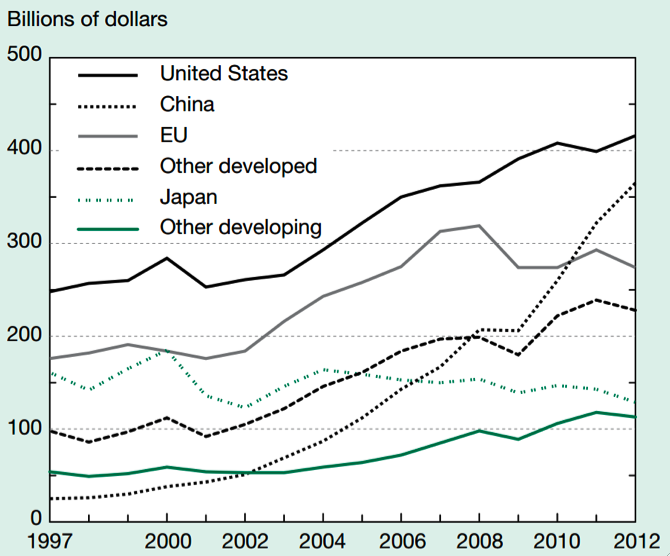 Another indicator of China’s R&D growth is ‘R&D intensity’—a measurement of R&D expenditure against GDP. While China started from a low base of 0.5% of GDP in 1996, it has now surpassed Europe , and has grown steadily to 1.98% of GDP in 2012. China’s output of scientific publications during the economic downturn has been described as ‘striking’  (PDF, p. 21) and the global influence of these publications has increased. China now has a higher number of college graduates—a large proportion with engineering degrees—who can explore advanced research challenges in future. As David Hale said in China’s New Dream , ‘if China becomes no. 1 in global R&D spending, it will shift from being an assembler of imported components into a leader in the creation and design of new products’. Leading the innovation charge is China’s private technology industry, which boasts some of the fastest growing global companies. Tencent Holdings —owner of social media apps WeChat and QQ—has a similar market capitalisation to Facebook, while telecommunications giant Huawei is challenging industry leaders  (PDF). The main drivers of innovation will continue to be access to new technologies and new markets, areas where Chinese companies are accelerating. Some observers have already heralded the ‘rise of China’s innovation machine’  (paywalled). Political and military leaders are taking inspiration from China’s technological change. China’s defence sector once relied almost solely on foreign expertise, obtaining key technologies from advanced nations of the world. The development of the Chinese version of the Russian Su-27 fighter and the indigenous J-10 fighter both relied heavily on foreign design expertise and industry experience. Until recently, in the minds of many PLA officials, it was far easier to ‘obtain jade from the rocks of other mountains’ (他山之石可以攻玉), through legitimate means or otherwise. However, indigenous defence production has always been the long-term aspiration of China’s defence strategy. China’s defence industry is already showing signs of the benefits of R&D spending. The production of increasingly advanced weapons such as the recently discussed hypersonic glide vehicle , the Dong Feng 21D anti-ship ballistic missile , and the Chengdu J-20 fifth-generation fighter aircraft  show the once laggard industry is making real progress. Today, the trend in China’s military modernisation is less imitation and more innovation. The Military Balance 2014  noted that China’s ‘indigenous defence industry has played an increasing role in providing military equipment’. Selective modernisation programs in aerospace, missile and IT industries, increased civil-military integration, and bolstered R&D expenditure place China in a better position to realise independence in defence production. This has strategic implications for defence planners, not least in the US. Development of indigenous technology that targets potential adversaries’ weaknesses brings into question assured US military access into the western Pacific. Anti-access/area-denial technology is dramatically improving, and modernisation of the People’s Liberation Army with a focus on ‘posing problems without catching up’  is complicating US force projection today. However, translating untested equipment into capability is a real test. It’ll take China many more decades to develop the operational abilities and military skills that take full advantage of technological development. China is narrowing the gap when it comes to spending on R&D, with considerable potential for increasing national power. China encourages high-tech industry, not just to bolster its economy, but also to increase influence and autonomy. Chinese strategists have recognised that global powers like the US possess more than military clout, having strength in many areas, or ‘comprehensive power’ (综合国力). The ability to convert resources into innovation into influence is a distinguishing feature of rising powers. As President Obama said in his 2014 State of the Union address , ‘the nation that goes all-in on innovation today will own the global economy tomorrow’. China is clearly listening. Simon Hansen is an intern in ASPI’s International Cyber Policy Centre .